The man in the high castle. Bidzina Ivanishvili’s residence overlooks old Tbilisi. (c) Besik Pipia / RIA Novosti. All rights reserved.Bidzina Ivanishvili is Georgia’s richest man — and probably its most powerful. 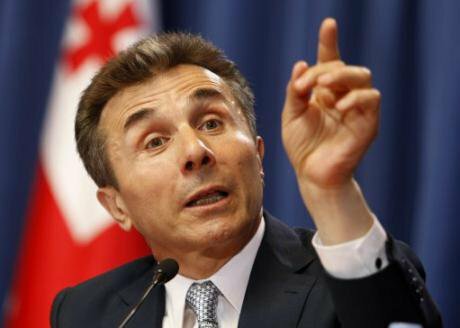 Since taking (and leaving) the post of prime minister in 2012-2013, Ivanishvili has remained influential behind the scenes. It’s an accusation the businessman has always denied, stating that he merely enjoys the trust of the public and politicians. Ivanishvili, who bankrolled the opposition into power in 2012, has had Georgia’s parliament in his sights for a while. In fact, he wakes up to it every morning — the oligarch resides in a glass mansion overlooking the Georgian capital. The construction of this villa began during the 1990s, under Eduard Shevardnadze. For most people, this was a dark time: one of corruption, crumbling infrastructure and severe shortages. But some people thrived. In 2003, Mikheil Saakashvili came to power in the Rose Revolution, toppling Shevardnadze’s corrupt government. This caused a problem for the man in the glass house — Ivanishvili’s mansion was not quite legal. The construction permit should never have been issued, as the house is located in a heritage and landscape preservation area. Nevertheless, Ivanishvili found a common language with the new authorities. He became a major sponsor, supporting many infrastructural projects and the reorganisation of the police, among other initiatives. The problem around his glass palace (complete with private zoo and art collection) was soon resolved. But Ivanishvili has another. His new glass palace is on another scale, as is the opposition to it. Tbilisi now awaits a new luxury complex, containing a hotel, business centre and conference halls — Panorama. Tbilisi first learnt about Panorama after Ivanishvili’s resignation in 2013. It’s an elite business centre with conference halls, a seven star hotel and a golf course. Its scale is truly staggering: it’s been described as the largest real estate development in the country’s history. The chairman of Co-investment Fund board, Irakli Karseladze, stated in May 2016 that the total investment in the fund’s eight projects is approximately $574m. Panorama is the biggest of these. The entire complex will have eight floors and sit atop another hill, just behind Bidzina Ivanishvili’s glass palace. Preparatory construction works by Burji, a company owned by Ivanishvili, are now underway. The land slated for development was owned by Finservice, another of Ivanishvili’s companies which specialises in timber export. Finservice later sold the land to Co-Investment Fund, of which Ivanishvili is the biggest shareholder. Check out this video of the proposed project. Panorama will do more than overlook Tbilisi. Ivanishvili wants to connect it to the city centre via two cable cars — one to the central Freedom Square, and another to Erekle Square in the oldest part of town. One justification is practical: Panorama would otherwise be accessed only via a narrow mountain road that links Tbilisi to its surrounding villages, which is easily congested. But there’s also money to be made. Both sites for proposed cable car stations belong to Ivanishvili’s Co-Investment Fund. 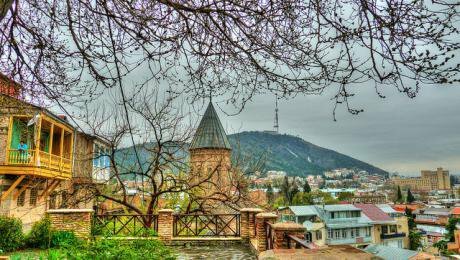 Indeed, Tbilisi’s old city, founded in the fifth century, belongs to a Historic Preservation Zone, which strictly regulates new developments in order to preserve the historic atmosphere. Getting planning permission is usually a long process — unless you’ve got connections. After the Rose Revolution, the land for Bidzina’s palace lost its protected status. It was a way of saying thanks. Yet the site for Panorama is still within this protected zone, where new construction is prohibited by law. The Panorama project violates regulations both on historic and natural landscape preservation. Half-hearted attempts to make it comply with the latter are no less damaging — in a pale imitation of the surrounding mountains, the building will resemble a hilltop. The natural beauty it will replace is already being torn up to make room. Under Saakashvili, plans were developed to reopen an old Soviet cable car system linking Rustaveli Avenue to the Mtatsminda mountain, where Tbilisi’s TV tower stands. The city-side station was planned on the other side of Rustaveli Avenue, on a big square, and the cable car would cross the city’s main avenue. Mass protests under both Saakashvili and Georgian Dream led the city administration to cancel the project. This time, the protests go on — but the authorities aren’t listening. Several international organisations working in the field of cultural heritage have signed an open letter against the construction of Panorama. Moreover, experts say that Panorama could seriously jeopardise Old Tbilisi’s tentative status as a UNESCO world heritage site. Speaking in a television interview in September 2015, Tbilisi mayor David Narmania insisted that the project will benefit the city, adding that international organisations who protested were simply misinformed. These reactions don’t disturb Ivanishvili in the slightest. In a television interview with G-News from July 2015, he promised that the project would benefit the city, stressing that he would never do anything to harm Tbilisi or its heritage and everything is legal. The protesters, he added, were being manipulated by Saakashvili’s party of power, the UNM. In another interview in June, Ivanishvili refused to answer questions regarding Panorama, saying he already commented on it many times, asking the interviewer to move on to the next topic. 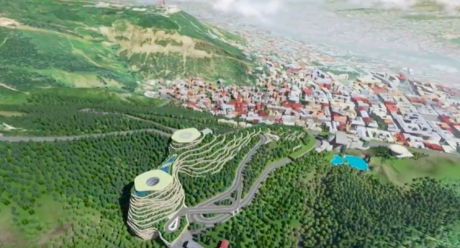 Visualisation of the Panorama Project, overlooking old Tbilisi and its botanic gardens. Image still via 2030 Official / YouTube. Some rights reserved.Ivanishvili has been cunning and resourceful. The first legal hurdle for Panorama was to overcome the protected status of the land. The proposed construction area was part of a landscape and recreation zone which originally did not allow any construction, but later had its zoning permissions changed to allow for a hotel and artificial gardens. This vote at Tbilisi’s city council (where Georgian Dream held a majority) took place just before New Year’s eve 2014, and went in Ivanishvili’s favour. The Panorama site is now an enclave within the protected area owned by Ivanishvili’s Co-Investment Fund. Next came the construction permit. In an attempt to avoid the city municipality (the mayor and the council are directly elected by citizens) and avoid protests in front of the city hall, Panorama was granted an unprecedented status — “category five”, which is assigned to any crucial state infrastructure, such as hydroelectric dams, energy plants, military bases and pipelines. Now, it would seem, luxury hotels also count. Category Five projects do not have to seek municipal approval. Instead, they are overseen by Georgia’s ministry for economic and sustainable development. Oversight was thus shifted from the municipal level to the ministerial, hollowing out all public accountability. The Panorama site can only be reached by a narrow, winding road in the hills above Tbilisi, which starts in the historic Sololaki neighbourhood. In summer, Tbilisi residents escape the heat of the city and drive up into the mountains. In its generosity, the Tbilisi municipality announced that it would construct a bypass road to ease access to the villages in the hills above the capital. It seems that, though the municipality was so weak in the face of Ivanishvili that it could do nothing to address public outrage on Panorama, even Ivanishvili himself did not trust his protégé mayor David Narmania to carry out his instructions. Old Tbilisi, as viewed from Betlemi Church. The fate of the area’s many historic buildings has become a cause for concern in recent years. CC: Roberto Strauss / Flickr. Some rights reserved.Thus, several hundred trees were cut down, a gas pipeline was moved and the existing road was widened. At the same time, the auction to sell land adjacent to Panorama was announced. Naturally, the Co-Investment Fund was the only bidder. Liluashvili mysteriously resigned, the land was purchased, and construction of a new road to the site of Panorama began. The people of Tbilisi, escaping into the hills during those hot summers, still await their promised new road into the mountains. Ivanishvili’s philanthropic work is endless, and he has enjoyed a good reputation among the Georgian public (which proved useful when Saakashvili’s regime became increasingly authoritarian). But how long can this reputation last? At every step of the way, Panorama has managed to evade legal procedures, despite opposition to it. Architects, urban planners and conservationists were outraged by the immense scale of urban intervention the project envisaged. Ivanishvili was unpleasantly surprised, apparently not expecting much resistance given his reputation as a philanthropist. 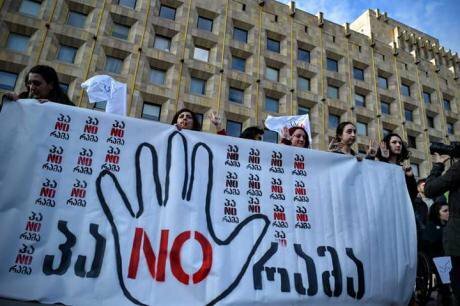 Panorama has galvanised many parts of Tbilisi’s civil society. The protest movement Ertad (Geo: “together”), founded in 2015 to unite various activist groups, was one outcome. Ertad members include Tbilisi’s Guerilla Gardeners, who fight to preserve urban green spaces. Its members recently organised a hunger strike in front of the city hall to protest cutting down trees for residential development. Putting the “no” into Panorama. Activists from Ertad protest outside the State Chancellery in Tbilisi, April 2016. Photo courtesy of ერთად / Ertad.Another ally is Iare Pekhit (“Walk”), an association which promotes Tbilisi as a walkable city, emphasising pedestrians’ rights and holding the Tbilisi “Ugly city” tours, focusing on architecture and the use and misuse of public space. There are more groups active in the struggle against Panorama. Hamqari is a Tbilisi-based NGO involved in the protection of Tbilisi’s cultural heritage, while the youth activists at Green Fist started out protesting the controversial Khudoni hydroelectric dam. In total, around 20 organisations organised a march on 7 May to the Panorama site and Ivanishvili’s residence. Two hundred protesters took part. Several activists were arrested, including Nata Peradze from Guerilla Gardeners, and Alexander Elisashvili, city council member and advocate for heritage. The official reason was resisting to police and disturbing public order. Although Ertad’s activists lacked experience and effective organisation, their resistance was a promising example of a united protest against such a large project. Georgian Dream prevailed at Georgia’s recent parliamentary elections. It was hardly a rousing endorsement, but enough to hold on to power. However, should the party triumph in the second round of elections this month, it will hold enough seats to amend the constitution, cementing its power even further. It’s worth noting that Georgian Dream came to power in 2012 on the back of mass dissatisfaction with Mikheil Saakashvili and his United National Movement. Ivanishvili himself promised a level of democracy unprecedented even for Europe. Saakashvili had aimed to rapidly modernise the country. Architectural projects were the best means to demonstrate progress. As a result, government initiatives didn’t go through public hearings or reviews, while permits were dispensed by officials who frequently ignored planning considerations. Bidzina Ivanishvili’s Georgian Dream coalition ousted Mikheil Saakashvili’s UNM government in 2012. The reclusive billionaire then briefly served as prime minister. (c) Shakh Aivazov / PA / Press Association Images. All rights reserved.Panorama is in keeping with this tradition. Ivanishvili has decreed that his project is good and necessary for the people of Tbilisi — not that he ever took their opinion seriously. But there is one important difference. While Saakashvili’s many ad-hoc urban innovations were imposed from above, extremely expensive and of unclear purpose, they were at least public buildings. 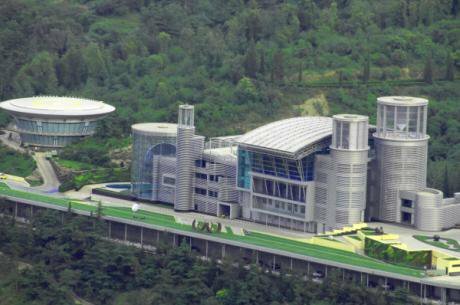 Ivanishvili’s initiative is a privately-owned complex of truly monstrous proportions. Whether it’s Ivanishvili or Saakashvili, the attitudes of the powerful to Georgia’s urban space and its responsible use have not fundamentally changed. The right amendment can always be made, the right permit can always be found, the right people can always be convinced to vote the right way. Those with financial or political influence feel that nobody can stop them. Obsessed with their pet projects, the desire of the powerful to make their mark on our city overrides previous promises of democracy and public accountability. Georgia is still looking for leaders with more respect for their voters — voters who want to live in cities in which their voice counts. Amid widespread apathy and corruption, Georgia’s democracy faces all too familiar obstacles. Read about them here.